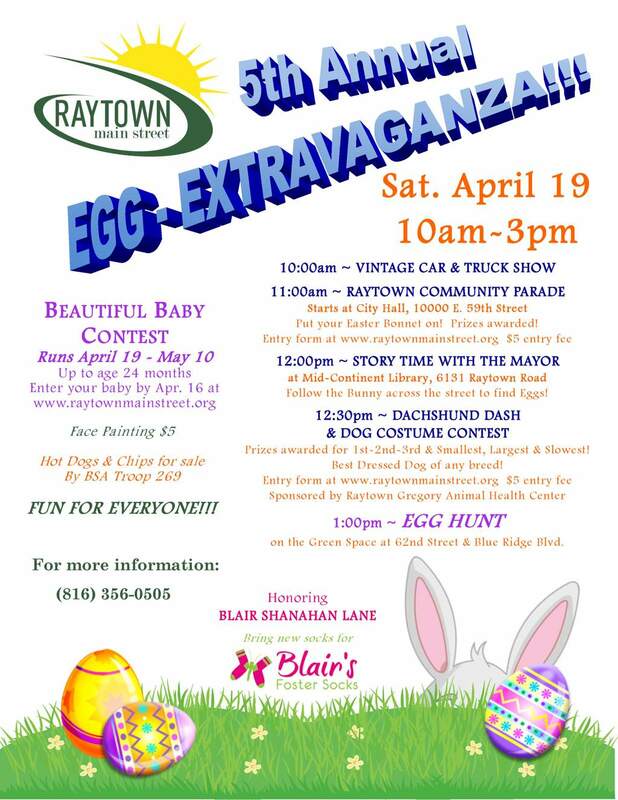 On Saturday, April 19, the Raytown Main Street Association will present the 5th Annual Egg-Extravaganza in Downtown Raytown. Kicking off the festivities at 10:00 a.m. in front of the green space at 62nd St will be the Vintage Car and Truck show. At 11:00 a.m. children and adults alike will want to look for the Easter Bunny as the Raytown Community Parade sets off from City Hall, 10000 East 59 St. This year the parade promises some egg-xtra special entrants, including Clydesdale horses, and the chance for parade participants to win for best dressed as they walk past the parade judges. Everyone in the community is encouraged not only to attend but also to participate; you can even come as Peter Rabbit! Once the parade reaches the green space, it is time for Mayor David Bower to read to the children at the Mid-Continent Public Library, 6131 Raytown Road. The Mayor will share a special children’s story from 12:00-12:20 p.m., keeping all the little (and big) ones engaged prior to the Egg Hunt. At 12:30 p.m., the Dachshund Dash and Dog Costume Contest, sponsored by Raytown Gregory Animal Health Center, will show who the true “hot dogs” are in Raytown. Entry fee is $5.00 per dog; prizes awarded for the 1st-2nd-3rd & smallest, largest and slowest. Egg-Extravaganza; it is slated to run through May 10 at the Farmer’s Market. To enter, proud parents and grandparents need a current 5×7 photo of the baby with baby’s name and parents name printed on back of photo.? Contest is open to babies 1-24 months. There is a $20.00 Registration Fee for each entry.? 1st place winner will receive a gift basket plus $100.? 2nd and 3rd place winners will receive gift baskets. A “vote” is .25 cents. ?There will be a large paper mache egg filled with prizes for children and their parents that will be raffled off $1.00 per ticket. The free community Egg Hunt will begin at 1:00 p.m. in the green space. The Easter Bunny will be on hand to preside over the great hunt, which is a favorite of children and parents alike every year. Make sure to check out the vendors too; right before or after the Egg Hunt is a great time to do so. You can buy a hotdog lunch, too, courtesy of BSA Troop 269—just don’t tell the dachshunds!